The attack on the World Trade Center and Pentagon was one of the great disasters in United States history. Why did it happen? Not for one reason only. Disasters in modern times usually have multiple causes. Each cause, taken alone, are survivable and few bad results flow from it. But when 9 mistakes intersect, then there is a disaster of monumental proportions. In the mid-1980's, a Chinese Boeing 737 was hijacked. It landed at the Shanghai airport and crashed into another 737 which was on the ground. Two airplanes, worth $20 million and 400 lives were destroyed. On the basis of that event, analysts at the Institute of Election Analysis concluded that China would have to change toward democracy. The hijacking proved that in a high technology society, one desperate individual can do unprecedented amounts of damage. China could no longer afford to have desperate individuals in their midst. The World Trade Center and Pentagon attacks prove that the world can not survive as long as there are desperate, angry, suicidal people. 1. Bush's and Gore's refusal to discuss the Israeli-Palestinian conflict during the 2000 election campaign. Since the beginning of the new intifada one year ago, the Palestinians have relatively suffered a World Trade Center every two months. Yet, during the U.S. election campaign last year, with Palestinians dying daily on television newscasts and the front pages of the newspapers, when asked about foreign policy during the rigged debates that excluded Pat Buchanan and Ralph Nader, both Bush and Gore said "Kosovo" and dodged what was clearly the major foreign policy problem, the Middle East. This did not change even after 17 United States sailors died on the U.S.S. Cole. The deaths in Israel and on the West Bank and Gaza did not get the attention of the two major party candidates for president. The deaths of 17 sailors did not get their attention either. This is the main reason why the World Trade Center and Pentagon was attacked, to force the United States to get back into the Middle East peace process and to push it toward a final resolution. Bush and Gore would not have been able to avoid discussing the Middle East if Pat Buchanan had been included in the debates. Buchanan worked in the White House during the 1973 Yom Kippur War. One lesson that can be learned from the World Trade Center and Pentagon attack is that the purpose of elections is not only to pick a winner, but also to discuss issues. The exclusion of minority viewpoints from debates under the rubric of "can't win" is a dangerous practice. It is more than unfair, it is fatal to a democratic society. There can be no freedom of movement, or a free market economy, in a culture that forcibly prevents the expression of certain ideas. 2. The second political reason for the attack is that George W. Bush ran on a war platform. When asked during the campaign if he favored peace in the Middle East, he said, "Yes, but on their (Israel) timetable, not ours." Bush did what Nixon did to win the election in 1968. He undermined the foreign policy of a sitting President by implying that our ally would get a better deal if he won the election than it would get from his opponent. Once installed in the White House, Bush pulled out of the Middle East peace process (which was our process in the first place.) It took over 5,000 dead, $20 billion in direct damage, and another $trillion in equity wiped off the world's balance sheets to teach George W. Bush what the American voters said last November, namely, that they wanted a president who would push on with the Middle East peace process. That's why Gore carried the country by more than 500,000 votes. Only a fascist and a charlatan would think that distribution of votes in an election changes the meaning of that election with reference to national issues. 3. The third reason was the attempt of the Republicans to remove President Clinton from office during the last two years of his term. Because Clinton was forced to defend the wishes of the voters from attack by people who sought to remove him from office for legal technicalities ("he lied under oath") President Clinton could not devote the time and attention necessary to protect the nation from attack. The politics of personal vilification, as opposed to discussing the issues, which in fact was started by the Democrats when they refused to confirm Senator John Tower as Secretary of Defense in 1989 (because he drank too much wine and pinched women's behinds) was the beginning of this trend. The failure to confirm Tower, the only enlisted man at the top of the Bush I cabinet, was a major factor in the 1991 Gulf War. Tower was arguably the most knowledgeable Senator on the issue of procurement. As a Senator from the oil state of Texas, he was already knowledgeable about Middle Eastern politics and security. Had Tower been confirmed, the 1990 invasion of Kuwait might never have taken place. It was the 1991 Gulf War which resulted in the permanent stationing of United States troops in Saudi Arabia, the proximate cause of Osama bin Laden's anger. 4. The Two-Party System. Last year, over 10% of the members of the House of Representatives ran without even nominal major party opposition. On the state level, the number of unopposed candidates is much higher. The hijackers lived in Florida and Massachusetts. In Florida last year, over 43% of the U.S. Representatives had no major party opponent, 7 Republicans and 3 Democrats. In the Florida State Senate, 50% had no opposition and in the Florida House of Representatives 41% had no opposition. In the old days of the corrupt urban political machines, immigrants were registered to vote right off the boat. There were block captains and district leaders. The political organizations knew every person who lived on every block. That was necessary for political survival. In contested elections, every vote counts. But in uncontested elections, where elections are won by massive amounts of money buying media time while candidates without money, who represent minority opinions, are not covered in the media or even permitted to attend the officially sanctioned candidate debates; office holders are not longer required to even know who their constituents are. In addition, the Republican and Democratic parties are in collusion, as they were during the 2000 presidential election. They rig races, in many cases by mutually agreeing not to run candidates against each other or by deliberately running straw candidates who they know can not win. Elections in the United States have become Kangaroo Contests. So, the hijackers could live in Florida in relative safety because the politicians in Florida no longer know who lives in their districts. They do not have to, because they win elections through back room deals with the other party's leadership, not through democratic contests decided by the voters. The same is even more true of Massachusetts. Half of that state's U.S. House Delegation runs unopposed. The Massachusetts State Senate runs 72% unopposed and the State Representatives run over 70% unopposed. No wonder the hijackers could live in Massachusetts without arousing suspicion. Along with unopposed political leaders, segregated housing is a similar cause. Every state has segregated ghettos where all kinds of dangerous activities occur all the time. The hijackers lived and operated in poor, segregated neighborhoods where no one would pay any attention to their activities. For years, many people have complained both about the pro two party bias in elections and about the segregated housing patterns in the United States. They were dismissed as unrealistic, not pragmatic and idealistic. After the World Trade Center and Pentagon attack, maybe it is time to admit that they are right. If every election for every office was contested, not just by two, but by several viable candidates, then every person in the United States would be noticed and contacted on a continuing basis. Democratic elections are not just about picking winners, they are about discussing issues and including people in their own government. A side benefit, is that honest elections protect the people while dishonest elections permit groups to operate out of sight and below the radar. 5. The World Trade Center and Pentagon attack at least proves one thing, that the All Volunteer Military failed to protect the nation. After the Oklahoma City Bombing someone wrote an article called, "Better Gays than McVeighs." The United States Military is currently a self-selected group of people who are being permitted to discriminate against honest people who want to defend their country but are prevented from doing so because of their private sexual preferences. The investigative units of the armed forces are spending so much time and energy trying to weed out gays that they are overlooking the heterosexual psychotics in their own ranks. World War II was won with an overwhelmingly conscript Army. In a democracy, the military should be open to all people. Furthermore, the fact that the draft has been abolished, has not only raised the cost of the military, but it has put young men to sleep in terms of their duty to understand foreign policy and then to vote in elections. People who are at risk to be drafted for wars pay closer attention to what those wars are about than people who are not in harms way. The all volunteer army was created to stop the protests against the Vietnam war. It worked. Now the problem is that the military has become essentially mercenaries fighting colonial wars in Africa, Latin America and Asia. There is no clearer proof of the disconnect between the military and the American people than the fact that both Gore and Bush dodged the issue of the Middle East during the 2000 presidential election even though 17 sailors were killed in early October, during the heat of the campaign. Bush and Gore could avoid even mentioning the Cole deaths because voters, most of whom have not served in the military and the young men who see themselves as immune, no longer identify with the sailors who were killed. This is both dangerous and a scandal. No wonder the bombers of the Cole had to up the ante to the World Trade Center and Pentagon. The politicians and media do not care about only 17 deaths, just like they do not care about individual votes or voters. So the people who killed the Cole sailors had to kill over 5,000 people in New York to make their point and be noticed. Also, Mohamed Atta, the hijacker of the first plane to fly into the World Trade Center, allegedly left a will asking that women not be allowed at his funeral. Maybe Mohamed was gay. If so, the all heterosexual volunteer military may have difficulty penetrating terrorist cells that do not share its sexual proclivities. 7. In the spring of 2001, the biggest air travel related issue was delays. People were complaining that their flights were arriving late, baggage was being lost, and airlines were not keeping passengers informed about the reasons for the delays. Two pieces of legislation were introduced in response: the Airline Customer Service Improvement Act and the Airline Passenger Fair Treatment Act of 2001. Both pieces of legislation were to pressure the airlines into improving passenger related problems. While not punishing airlines for running late, the legislation did provide penalties for airlines that did not keep accurate records of their on-time performance or did not make these statistics available to the public. The airlines were also required to inform passengers of the reasons for delays if those delays occurred more than two hours before flight time. The message to the airlines was clear. Fly on time. Even before the September 11 attacks, some people questioned the priorities of the legislation. Many people worried about the safety of flying even before September 11th. Misplaced political priorities were a contributing cause of the attacks. The hijackers understood the pressure to keep to the schedule and exploited it to book first class seats on the first westbound flights of the day. 8. The FBI and security services have been watching the wrong people. The police forces have devoted too much of their time and energy to playing politics to advance their own agendas within the political system, at the expense of doing their proper jobs. The proof of this is that Larry Lawrence, the Clinton Administration's Ambassador to Ireland, had to be disinterred from Arlington National Cemetery because he had not served in the Coast Guard, as he claimed. How could such an error have not been discovered during the background check prior to his appointment as Ambassador? The security services are monitoring peaceful, albeit left leaning, groups like Amnesty International, which only writes letters to dictatorial regimes seeking the release of political prisoners. If the security services are monitoring groups like Amnesty International, it is no wonder they do not have the manpower or capability of infiltrating the real threats. 9. The construction of the World Trade Center itself which was illegal and a dirty deal done by Nelson Rockefeller. It was built by the Port Authority of New York and New Jersey with tax exempt bonds on a parcel of land acquired with the power of public condemnation. For an office building. 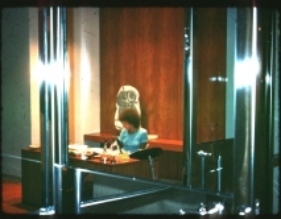 To read full article on the history of the construction of the World Trade Center, click on photograph of the receptionist in the Secretary of the Port Authority of New York and New Jersey's Office in the World Trade Center, July 1977. At the moment, the United States is heading toward making a tenth political error as a result of the World Trade Center and Pentagon attacks. The United States is calling the attack terrorist and insisting that it has no meaning, that there is no link to the events in the Middle East. That means that the United States sees itself as having been perfectly in the right before the attack, and that in order to recover all that is necessary is to return to the situation that existed before. This is never going to happen. The attack on the World Trade Center and Pentagon was a military attack. The Republicans and Democrats are calling it a terrorist attack as a cover-up for their own incompetent acts which contributed to the disaster. World Peace can not be built on a foundation of dictatorial, hereditary regimes and mass misery. For years, many psephologists have worried that United States support for anti-democratic regimes around the world would one day destroy democracy at home. Now, that day has arrived. The militarization of daily life, the constant claims of threats of attack, the erosion of civil liberties, are all part of the cover-up of the stolen presidential election and the decades of collusion between the Republican and Democratic parties against truly democratic government in the United States.